HaltBurn by Westwood Wellness Reviews - Is it a Scam or Legit? Using natural ingredients you mix with a liquid of your choice, Westwood Wellness states that HaltBurn offers relief for those who suffer from heartburn. We'll take a look at the claims to help you decide whether it's for you. 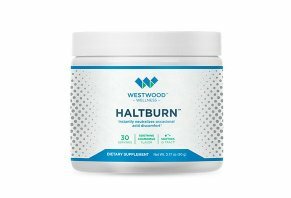 HaltBurn by Westwood Wellness Review – Get Heartburn Relief? HaltBurn by Westwood Wellness is a powdered combination of herbal ingredients that claims to reduce your heartburn. What makes HaltBurn unique is that you mix it with water – a marked departure from antacid tablets or heartburn pills like famotidine – and that it uses a combination of four natural ingredients rather than the calcium carbonate that you often see with antacids like Tums. Westwood Wellness is the company behind the supplement. A quick review of HaltBurn’s fine print indicates that Westwood Wellness is based in Beverly Hills. In addition to HaltBurn, they sell another product called “BioFlux” whose main ingredients are the same as HaltBurn. The company includes on the HaltBurn website a headshot and bio of a Dr. Peyton Berookim but does not explain the doctor’s affiliation with the product, nor does the doctor provide any recommendations or support of the supplement. As you considering buying a supplement like this, it’s important to know which ingredients the supplement contains as well as how those ingredients work. Once you have this information, research is important. Do the ingredients do what the company says they do? We’ll figure this out by looking at current research regarding each of HaltBurn’s four main ingredients. After we discuss what science says about this supplement’s ingredients, we’ll list the pricing and return policy. Finally, we’ll do a comparison of how this supplement compares to the ratings and effectiveness of popular antacids. As we mentioned a few seconds ago, this supplement is a powder. You'll take it once a day by pouring one scoop into a glass of water or any other beverage you prefer. Each jar of HaltBurn has enough powder to last 30 days when you use it once a day. This method of taking an antacid is interesting to us because drinking a supplement may be more appealing to some people than taking a fistful of chalky antacid tablets. As someone who frequently takes antacids, I can tell you that drinking a heartburn-fighting supplement is a nice change of pace from tablets. Westwood Wellness sweetens the supplement powder with stevia extract, a natural sweetener. The company doesn’t say exactly how the ingredients help reduce your heartburn. Rather, they make simple statements referring to what life could be like without heartburn. “If you’ve ever struggled with digesting your favorite foods... and acid-related nighttime cough... a burning sensation that just won’t quit... or embarrassing belching... HaltBurn is the revolutionary discovery that can turn it all around, and get you feeling like yourself again,” the site says. We wanted to know exactly how this supplement could help with heartburn, so we turned to reliable health websites Healthline and WebMD to get their take on the pros and cons of each ingredient. According to WebMD, prickly pear cactus has been used for a variety of ailments, the most notable of which is type 2 diabetes. The site also points out that taking a supplement comprised of this cactus can reduce the effects of a hangover. Side effects of using prickly pear cactus may include an upset stomach, bloating and diarrhea. Based on this information, it’s our opinion that this ingredient doesn’t have a solid reputation for relieving heartburn. The label pairs olive leaf extract with prickly pear cactus, too. Information from Healthline about olive leaf indicates there isn’t much evidence it can help with heartburn. The old saying that an apple a day keeps the doctor away is somewhat accurate in that eating fresh apples has multiple possible health benefits. Healthline points out the various ingredients in fresh apples can reduce the risk of cardiovascular disease and cancer as well as help with fat loss and muscle growth. The site goes on to say that apples have three ingredients that may help reduce acid reflux, which is a severe form of heartburn: calcium, magnesium and potassium. However, Healthline notes, there has yet to be any conclusive evidence that proves eating fresh apples or taking powdered apple extract can reduce acid reflux. “Although many people report success in treating acid reflux with apples, there isn’t any scientific evidence to support these claims,” the site says. We believe that the evidence Healthline presents suggests that apple extract may not be effective in combatting heartburn. Of all the ingredients on this list, chamomile is the one that has the longest list of claimed and research-supported benefits; including relief of bouts of depression and anxiety, easing digestive issues and may be able to “inhibit cancer cell growth and reduce the blood supply to cancerous tumors,” Healthline reports. That being said, the science surrounding this flower’s ability to reduce heartburn an acid reflux is a little less certain. There is a study from the pharmacology department at Cairo University that indicated a mix of herbs including chamomile could be as effective at fighting heartburn as an antacid. What’s important to understand is that chamomile was just one of many ingredients in the supplement the study administered. Therefore, it’s hard to say what kind of effect chamomile will have on heartburn when it’s mixed with HaltBurn’s other main ingredients. While chamomile seems to provide multiple health benefits, we think that that Healthline’s breakdown of chamomile’s uses doesn’t indicate there’s definitive evidence that it can neutralize heartburn. According to WebMD, slippery elm is taken for a variety of health reasons, some of which include ulcers and stomach acid. The site says that slippery elm’s magic is based on the fact that it includes chemicals that activate mucous production in your body, which subsequently coats parts of your body that could sting from heartburn. WebMD notes that slippery elm is “possibly effective” for sore throats but that there is insufficient evidence to prove that it’s a solid treatment for heartburn. Side effects are minimal when you take slippery elm orally. Based on what we read from WebMD, we see a lack of evidence to support the claim that slippery elm can ease heartburn. The site says purchasing one jar incurs shipping charges while buying multiple jars doesn’t. However, when we added one jar to our shopping cart, shipping was free. You’ll need to call Westwood Wellness at 800-719-5684 to start your return. There is a variety of heartburn-fighting, over-the-counter medications available for purchase at big-box stores like Walmart and Target, as well as on Amazon.com. There are two types of acid reducers here: day-long relief and temporary relief. Famotidine and ranitidine are examples of heartburn pills you can take once a day to get 24-hour relief. Assuming you take them once a day, one bottle of each will last you at least six months, which means you’re paying, at most, $1.56 a month to use the pills. HaltBurn, on the other hand, costs you anywhere from around $60 a month to $74.99 a month. The Alka-Seltzer and Pepto Bismol products don’t provide all-day relief; they’re temporary solutions. In this sense, they’re more akin to HaltBurn than famotidine and ranitidine. With that being said, they still cost less per month than HaltBurn. As we take a few minutes to review all the information we learned about HaltBurn’s ingredients and about other heartburn solutions, we think we’ve found some clear advantages and disadvantages. On the plus side, those who are looking for a natural way to combat heartburn will find HaltBurn’s natural ingredients a refreshing change from generic medications. Also, those who have an aversion to taking pills or chewing tablets will enjoy the liquid soluble powder. With those things in mind, though, we believe that the supplement’s main drawback – it's price – could be a prohibitive factor for those that don’t have a lot of money to spend on a heartburn solution. Our main concern is that the high price you’re paying is going toward a supplement whose ingredients may or may not help with heartburn, per conclusions we reviewed from reputable medical sites Healthline and WebMD. We believe, based on pricing and customer reviews, that famotidine and ranitidine have a better chance of relieving heartburn and at a significantly lower price. Many of the conclusions we’ve drawn in this review are common among supplements – it comes with the proverbial territory. If you want to learn more about buying supplements, we think it’s worth your time to read through our guide on how to buy a nutritional supplement. In this guide, we take you through three steps of buying a supplement and show you how to make a smart choice and avoid disappointment. Write a Review for HaltBurn by Westwood Wellness!